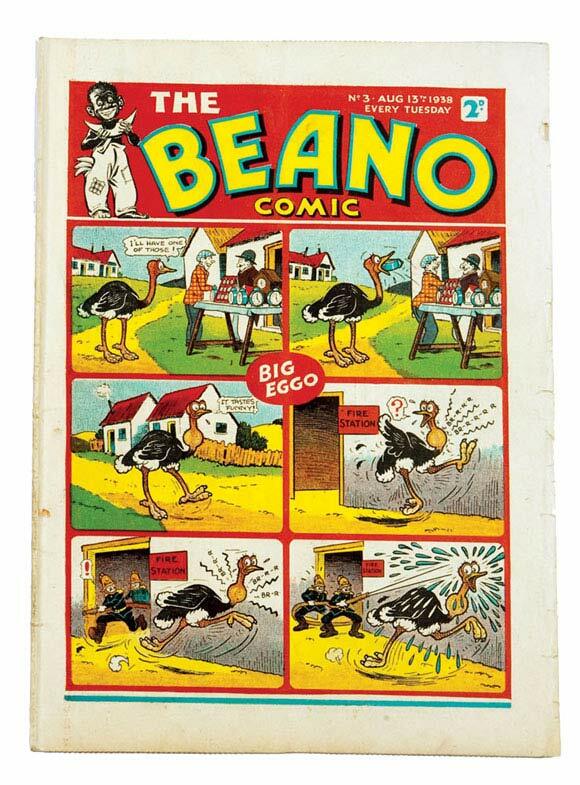 Our Beano Comic No 3 sold at £2200, a 50% premium to its upper estimate, this Fine copy strongly bid for rarity as well, with only a handful of copies known to exist. 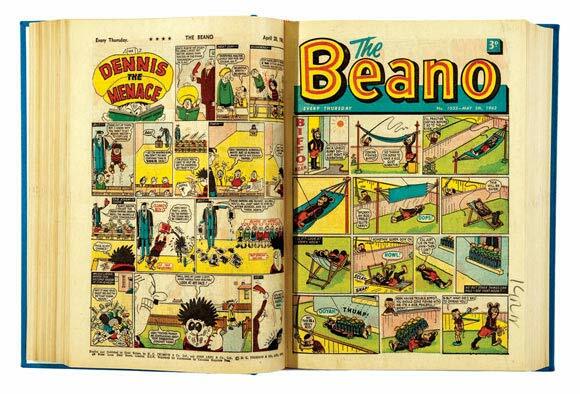 The first issue Beano reflected a different story, its £3500 successful bid significantly beneath the £5000 estimate. 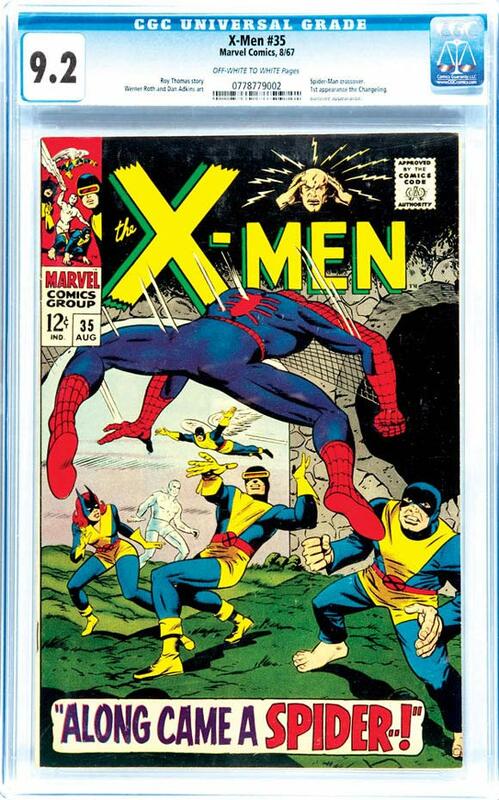 It was around the 20th copy offered in as many years and its VG Minus grade along with the current market conditions may have precluded stronger bidding. I had suggested in our last Market Report that high-end values were being eroded and recovery to former record levels, like the economy, may take some time yet. None of this concerned the winning bidder who was absolutely chuffed with his purchase. 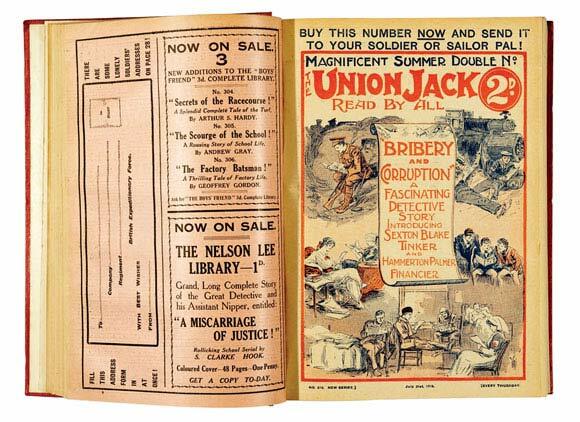 Union Jack, starring Sexton Blake stories throughout, was heavily bid with £528 given for 1909 (enclosing a wonderful 'Blackmail' full page flyer), and £594 was secured for 1915 and half-year 1917, including propaganda war issues with 'Stories From The Firing Line'. 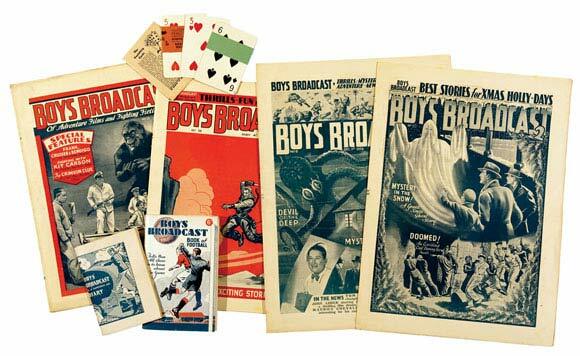 A rare complete run of Boys Broadcast was one of our high grade 1930s lots and secured £396. 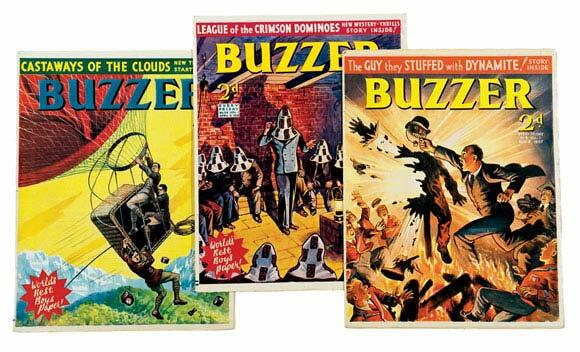 A similarly complete 36 issue Buzzer sawed to £275. 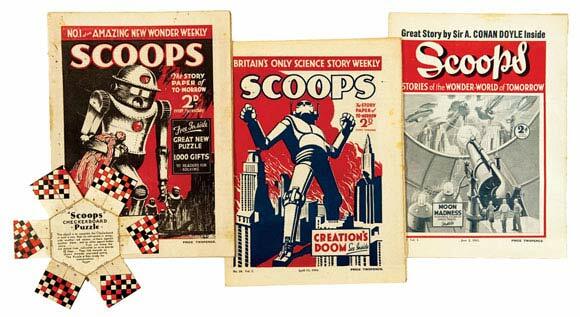 Scoops was the UK's first Science Fiction Magazine and featured a significant bonus in the form of a five issue serial by Sir Arthur Conan Doyle entitled The Poison Belt. This was another of our 1930s high grade complete runs which also included the rare Checkerboard Puzzle given away with No 1. £365 solved the puzzle. 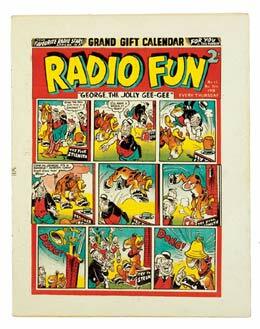 Radio Fun and Knock-Out were published by Associated Press and were long-running combatants with D C Thomson's Beano and Dandy for the schoolboy's jingling tuppence. 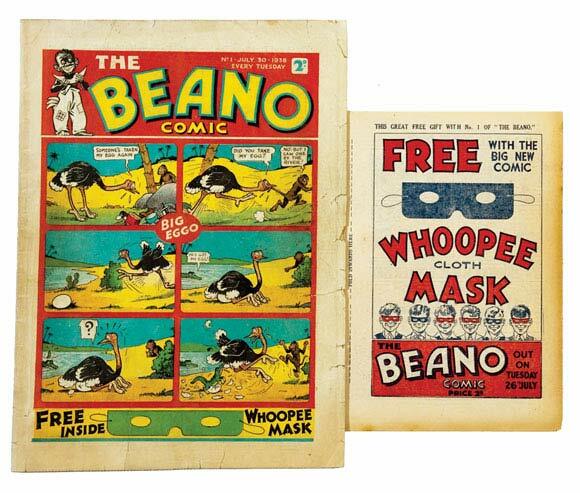 Often when only one comic was affordable, Desperate Dan and Big Eggo were neck and shoulders above Deed-A-Day Danny and George The (not so) Jolly Gee-Gee. In today's market rare high grades can change all that. 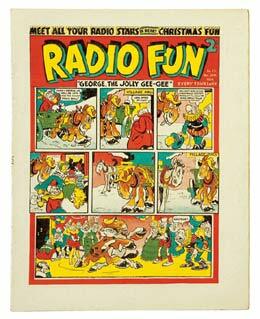 Radio Fun 11 from 1938, the first Xmas issue made £60, and No 12 followed with £35. 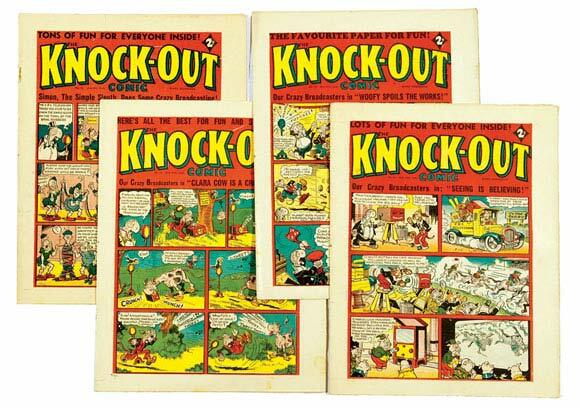 The Knock-Outs in Very Fine to Near Mint grades covering issues 11-20 found £20-30 each. Not even a body blow to Desperate Dan but he may need to put up his dukes as some more follow in November. Another fun-filled wartime adventure saw the Wee Lad down at the sweetie shop wi' a hard earned sixpence but 'Crivvens - they've sold oot - nae sweeties!' 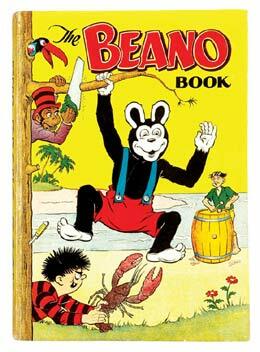 But the chemist has liquorice sticks so the boys invest and take them back to Ma's washin' hoose where they're cut up and vat-boiled into 'Sugarelly Water' and sold to the locals the followin' day - all profits to Oor Wullie's Spitfire Fund. Then Ma goes to do the weekly wash… £734 didn'a save him from a wiggin'. Aunt Aggie wants Dan to be clever like his uncle Erasmus. In the library Dan reads that fish is brain food se he drinks the lake dry, eats the fish, but he still can't add 2+2. 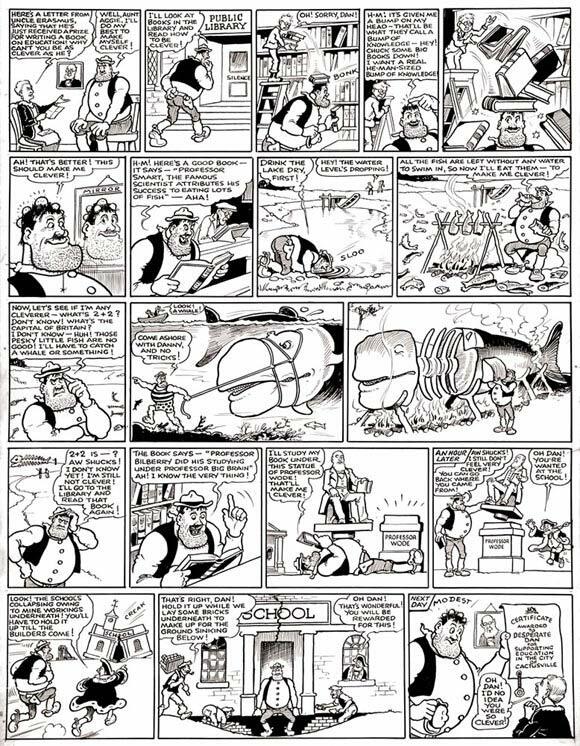 So he catches a whale for a snack - still no good - but duty calls, the local school's collapsing and Dan has to hold it up whilst the foundations are relaid…so the mayor awards Dan a Certificate For Supporting Education! 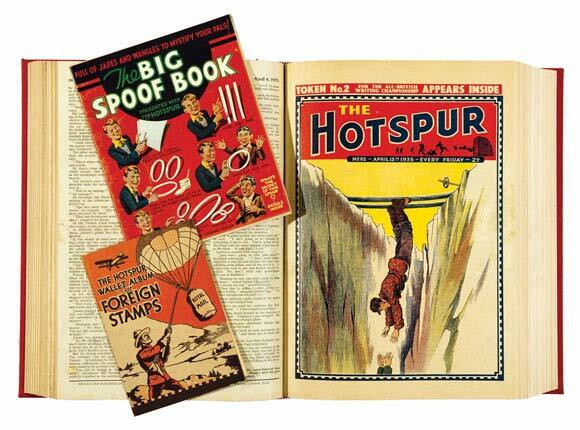 Aunt Aggie is so proud. .
Beano books from the 50s are not rare but high grades are so Jack Flashed to the moon with £276 and Biffo branched out to £176. 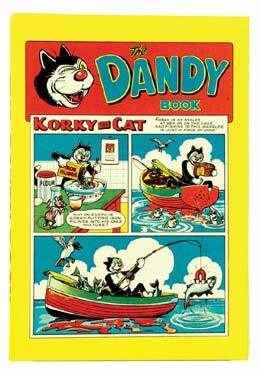 Korky and Beryl were also pursued in top condition, The Dandy Book for 1958 magnetised £220 whilst Beryl's first book was not ignored at her peril with £180. 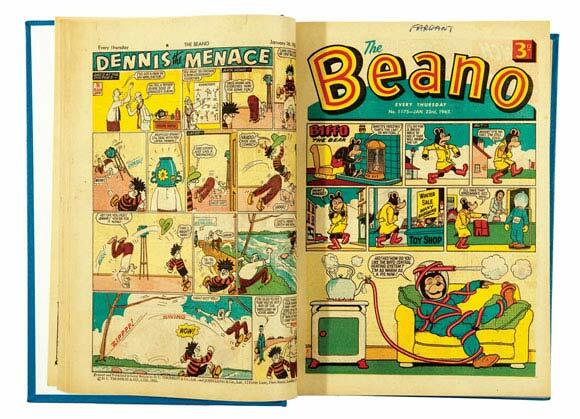 We have noted in previous Market Reports that early Sixties Beano and Dandy comics are rarer than those of the previous decade as DC Thomson lowered distribution in the struggle with a young audience waylaid by the upstart television and even its own outsize rivals Beezer and Topper. 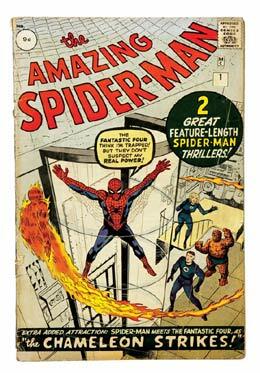 Consequently when they do come up at auction copies are fiercely contested. Two such lots appeared in this catalogue in the form of complete years in bound volumes in fn/vfn grades. 1962 and 1965 made a record £506 each and a further two years from 1969 and 1970 spiralled to £495 each. Big money at £10 a copy. 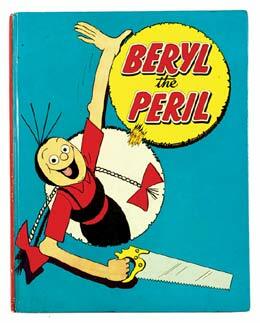 Martin Asbury took over the illustration of Garth in 1976 and is one of the UK's most in-demand storyboard artists. 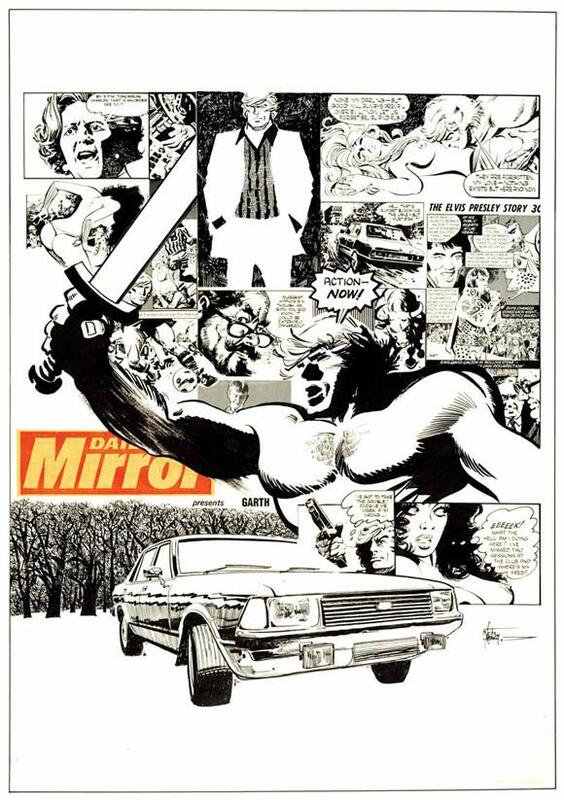 His Daily Mirror collage ad for Garth featured on our front cover and made £250 and four of his strips showing some female strips as well titillated to £101. 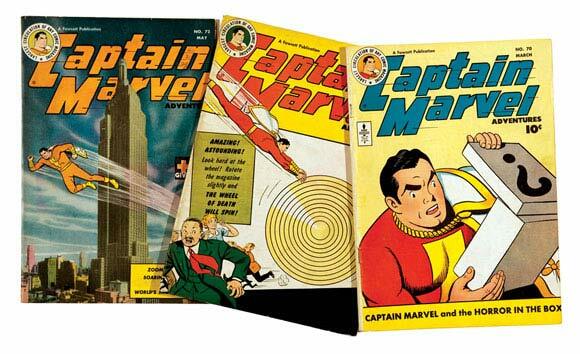 Our US section started with a good run of Captain Marvel Adventures from 1947 and issues 70-74 shazammed just under £100. 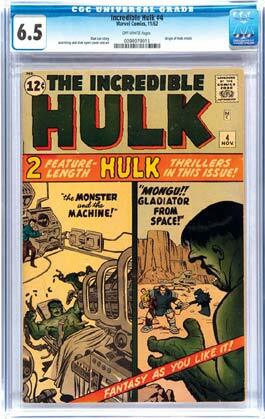 Stalwarts of the Silver Age Amazing Spider-Man and The Incredible Hulk are always in demand and our fist issue Spidey with biro name to back cover found a very respectable £480 [gd] whilst The Hulk issue #4 CGC'd at 6.5 monstered £276. 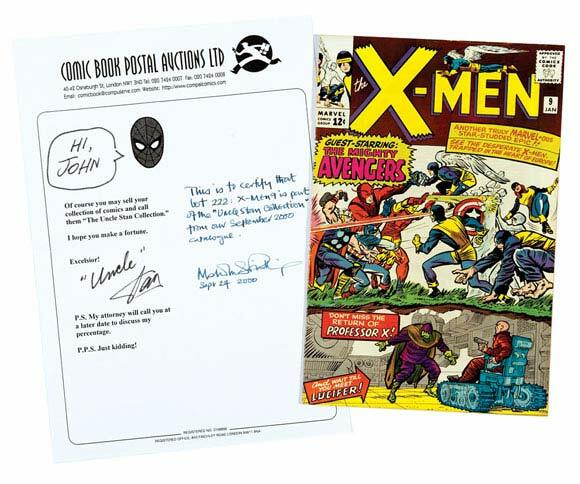 A 9.2 graded CGC'd copy of X-Men 53 with key cross-over Spider-Man cover and story battled to £261 and a rare blast from the past copy of X-Men 9 from our signature Uncle Stan Collection reappeared with letter of authenticity at £126. It was first sold in September 2000 for £111. I've had many conversations with our customers down the years over what our favourite comics are. Once we agreed on that there were then the favourite episodes with most entertaining adversaries and so on. 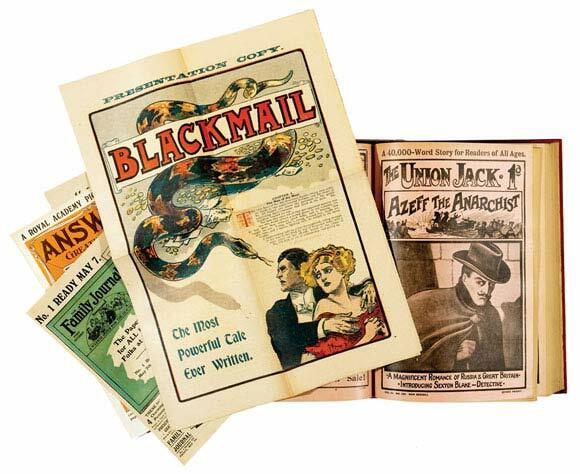 Ranging in discussion from The Dandy's Desperate Dan, who in 1942 drunk the Baltic dry to sink Hitler's navy, to Batman's arch-enemy, The Joker, whose acid rictus grin put a gothic shiver down the spine of every first time reader of Detective Comics. I have considered my own contestants for many years and have finally concluded that the comic to totally satisfy me has not yet been produced. 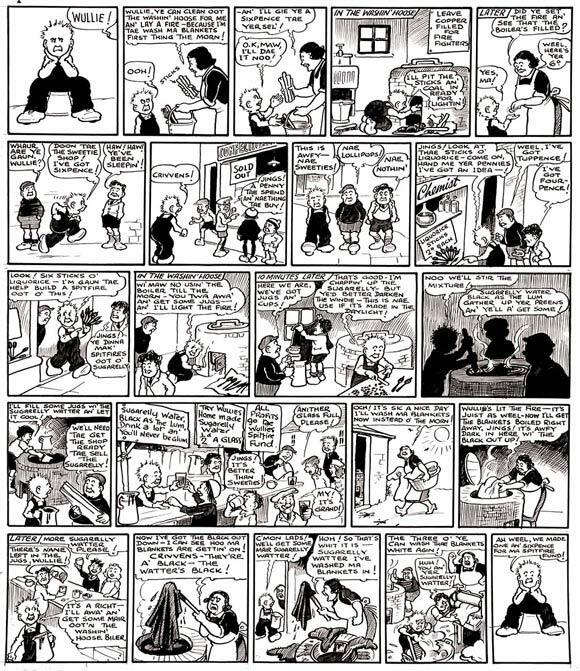 Of course I folded with laughter at The Broons and Oor Wullie whilst marvelling how cool it was that superheroes could save the world and also be married - Sue and Reed Richards, half of the fabulous Fantastic Four. (Sue was also invisible, so Reed had to do the washing-up when she couldn't to be found). For me there was always something missing. Chocolate. 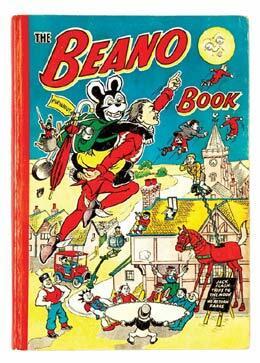 Why couldn't a publisher join with a confectioner and produce a comic made entirely of chocolate. You could take it out of the fridge, sit down and read it, then you could eat it. Perfect.